A priest is dead, bludgeoned after attending the death bed of a widow. There are no clues, other than a mysterious list of names found on the man’s body. Detective-Inspector Lejeune and Dr Corrigan the medical examiner have not much to go on, until Corrigan happens to meet up with an old classmate, Mark Easterbrook. Mark makes nothing much of it at first, other than knowing a recently deceased person with a surname that matches the list, but said person died of natural causes. Still, he begins to hear oblique references to The Pale Horse as a place where unwanted persons can be done away with and, subsequently, meets a gaggle of alleged witches at an inn by the same name, one of whom swears it is possible to induce a fatal illness in a person with psychic powers. Interestingly enough, this is the second Agatha Christie in a row I’ve read that uses a first person narrative. Surprising, because I didn’t really think she used them. I did not have the same disconcerted feeling while reading it this time, whether because I had just experienced something similar, or because Mark Easterbook is a far more stable and polished narrator than Michael Rogers. Also interesting is that the question of the supernatural was brought up again, also something I believed was relatively rare in Christie’s work. One thing does hold true to form, though, and that is the fact that I never can tell whodunnit. Although it was a bit of a change from Christie’s best known works, I really enjoyed The Pale Horse, as seamlessly put together as any of them. PBS will be airing a version of The Pale Horse in which they have inserted Miss Marple on Sunday, July 10th at 9pm (check your local listings). Join in the Twitter viewing party with the hashtag #agathachristie or watch it online later and come discuss it with us at Linus’s Blanket on Monday, July 11th. 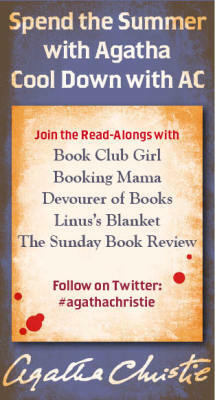 For the full schedule of Agatha Christie discussions, see the list at Book Club Girl. As a reminder, I will be hosting a discussion of one of Agatha Christie’s best known books, And Then There Were None (previously titled Ten Little Indians) on Monday, July 25th, so grab a copy and join in! I sure hope I get an Agatha Christie read before the summer’s over. The summer is just flying by for me. If you pick one up it won’t take you long! A twitter viewing party? Heck yes! I love Agatha Christie’s books, though sometimes I prefer the TV series. I was surprised by the first person narrative too, and confused since the PBS preview made me believe Miss Marple would show up at some point! Haha. I think it is bizarre that they are adding her to a standalone novel!